Close your eyes and picture a Mac laptop. It has a small screen in a case unique among a sea of PC notebooks. It runs without a fan, and has impressive battery life. The trackpad is smooth and the keyboard is responsive. Now open your eyes. Is this what you had in mind? Let's talk about the original "Clamshell" iBook. 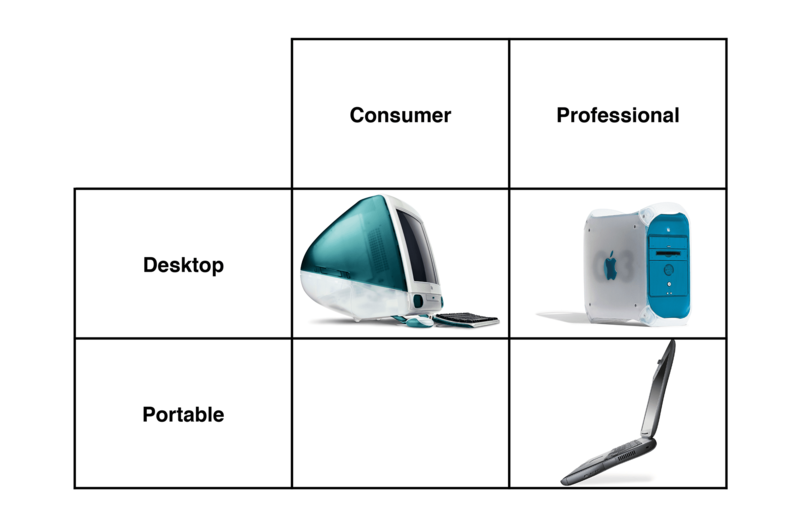 The burden of filling that empty spot would fall to the iBook, a computer designed for consumers and educators, according to Jobs. 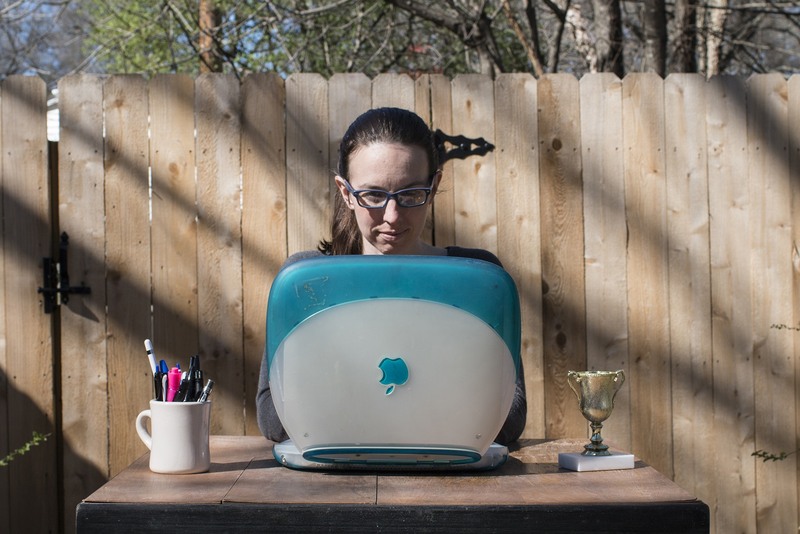 These users had been asking for an "iMac to Go," a computer with the ease of use and approachability found in the iMac G3. Built around a 12.1" screen and a 300 MHz G3, this new notebook exuded friendliness. It had a comfortable, full-sized keyboard, a CD-ROM drive, USB and 6 hours of battery life. The real story, however, was about the design. 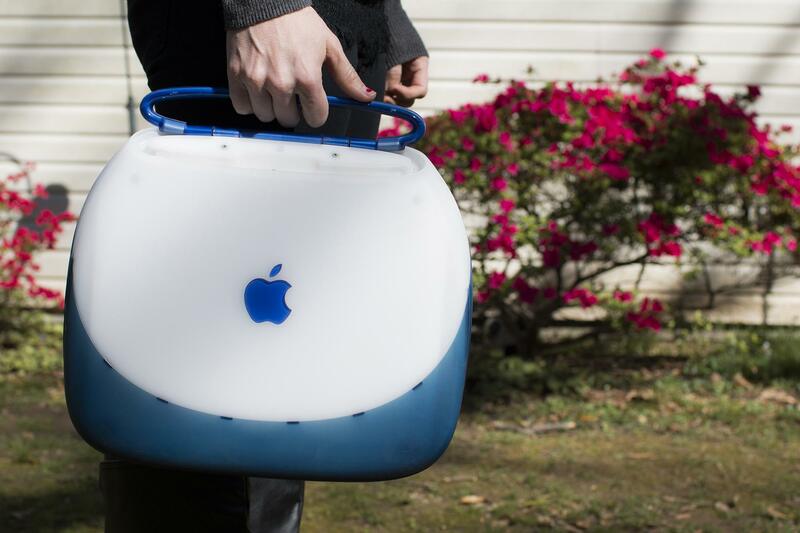 Instead of metal, the iBook was made of durable white translucent plastic coupled with double-injected rubber around the edges for additional durability and color. 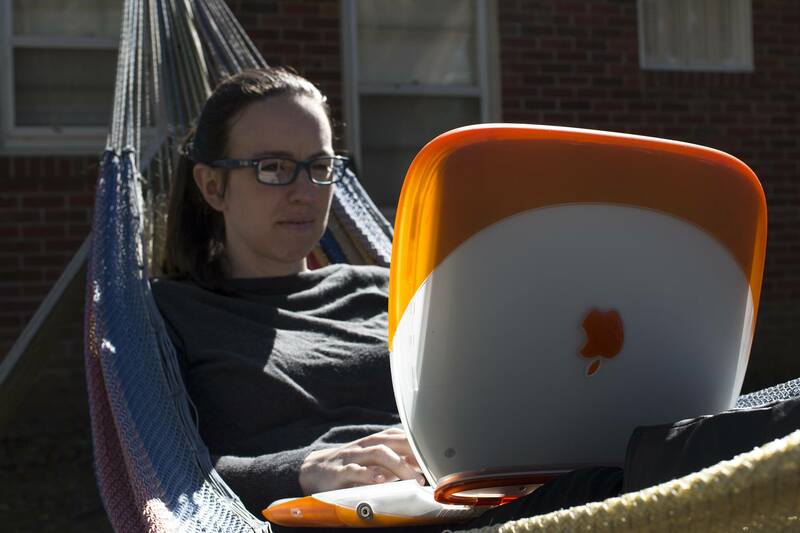 The curves this rubber formed, coupled with its bright white interior, earned this computer the nickname of "Clamshell." The first iBook came in Blueberry and Tangerine, like two of the iMacs of the day. The rubber cut across the lid of the machine, matching along the sides as it swooped to cover the entire bottom of the machine. The trackpad button and Apple logo1 under the screen brought splashes of color to the inside of the notebook. I think these Macs have more personality than any others. They're fun and youthful, and proved popular with students and home consumers. It even had a handle. It is easy to look at these computers and think that they were just remixed, slower iMacs. That is partially true, but Apple used the first iBook to introduce something brand new to the Mac line: AirPort wireless networking. To demo this, Jobs was browsing the web on a Tangerine model when he suddenly walked away from the podium. The cameraman followed, and the iBook kept loading the webpage as Jobs walked across the stage. To date, that's still my favorite moment in an Apple keynote. The AirPort found in the iBook is primitive compared to today's, of course. It was 802.11b, so it topped out at 11 MBps. It required not only a $299 base station, but a $99 AirPort card that snapped into the iBook under the keyboard. While it may not be impressive today, this helped put the iBook on the map. AirPort would quickly spread to other Macs, but these orange and blue laptops introduced wireless networking to the world of Mac users. Following a revision in February 2000 to the original models that included a faster "Special Edition" that came in Graphite, Jobs introduced the second-generation iBook G3. The new round of machines came with a faster base CPU clocked at 366 MHz. New colors were on tap: a subdued Indigo (seen in that handle photo above) and eye-popping Key Lime that is so bright, any attempts to photograph it usually end in a destroyed camera. The Key Lime was sold only via the Apple Online Store, a fact that got Jobs booed on stage during the announcement. In addition to these two models, Jobs announced the iBook Special Edition. Available in Key Lime and Graphite, this model came with a 466 MHz processor, making it the fastest Clamshell to ever ship. All of these models came with FireWire and iMovie, bringing it into parity with the iMac so many compared it to. No Clamshell can burn DVDs on its own, but Special Edition customers could play them back via the DVD drive found on the more expensive models. The Clamshell certainly had a fanbase around it, and still does to this day. Apple sold 700,000 of them in the 19 months they were on the market, according to a comment from Jobs as he replaced the machine with the white iBook G3. In one of the TV ads for the product, Jeff Goldblum asked if it was possible to fall in love with a computer. In a sultry voice, he purred "Oh yes; oooohhh yeeeees." I'm not sure that's true, but if you want to take a shot at it, you need one of these notebooks. They really are unique.